Any house fire is an emotionally gut-wrenching experience. Fortunately, not every house fire causes total destruction of our home and belongings thanks to home fire safety measures and the quick action of those brave men and women in our fire departments. But even a small kitchen grease fire can leave plenty of need for clean-up, not just in the kitchen, but throughout the house. Of course, the most important thing to do after any size fire is to have the home inspected for safety. There may be hidden damage to electrical wiring, wall supports, and foundations that should be corrected before cleaning and finishing cosmetic touches like painting walls. The inspection may be conducted by the fire marshal or by a representative of your insurance company. Once the site is cleared as safe to enter, you'll still need to take precautions before heading in to document the damage. Adults should be wearing close-toed shoes, long-sleeved shirts and long pants, safety glasses, and work gloves. It is best to wear face masks and keep small children away from the damage. This first look may be done along with your insurance adjuster. If possible, take along a camera to record the damage. Your insurance representative will update you on your home insurance policy coverage information and provide you with a list of qualified professionals to help with the clean-up and recovery. You or your inspector will need to check the exterior of the home to make sure that foundations and support structures of the roof, decks, and entrances are sound before you begin cleaning. If there was damage to the roof, check and clean gutters to remove any clogging debris or ash that can cause additional damage. Move on to the exterior walls. As soon as possible, use a power washer to remove as much ash, soot, and chemical fire retardants as possible. If the area of damage is small, you may be able to use a stiff brush and a solution of water and borax to remove the surface damage. If a Class A foam was used to extinguish the flames, it can be removed by scraping with a paint scraper. Try to work from the top of your home so the water and gunk run down onto uncleaned areas to prevent having to reclean. Windows will need to be washed with glass cleaner. Finally, tackle the walkways and driveway by removing any solid debris and power washing to remove soot and grime. Once you've been given the go-ahead by the inspector, it's time to begin the clean-up. If the damage is extensive, the best choice may be a professional restoration cleaning company. They can remove excess water, heavily damaged wood and building materials, and begin the process. For small fires, open all windows and bring in fans to help increase air circulation. Use a shop vac to remove any standing water. Pull out all wet vinyl flooring, carpets, and carpet padding. These will need to be disposed of properly. Remove all wet items to a garage or storage area for further inspection or cleaning so you can tackle the interior finishes. If the weather is harsh, the heating or air conditioning system will also help remove smoke from the interior. To help the odor dissipate more quickly, change the filters daily. Add a dehumidifier to the room and empty the collection bin frequently. Inspect all interior surfaces for soot. Don't forget to look up. Ceilings are frequently stained and will need to be cleaned before repainting. This oily residue stains badly and can be transferred by dirty hands and shoes. To remove soot from interior walls, cabinets, wood and metal furniture, and floors, mix a solution of two tablespoons dishwashing soap, four to six tablespoons trisodium phosphate, and one cup chlorine bleach with one gallon of warm water. Wearing rubber gloves, start at the top of the wall or area to be cleaned and wash one small area at a time using a sponge. Rinse each section with clear water immediately and allow the surface to air dry. The bleach will help reduce the chance of mold and mildew growth. Do not repaint walls and ceilings until they are completely dry, at least 24 to 48 hours after cleaning. If carpets are not wet but are soot-stained, they should be cleaned by a professional carpet service who may be able to add a chemical to combat smoke odors in the carpet and padding. 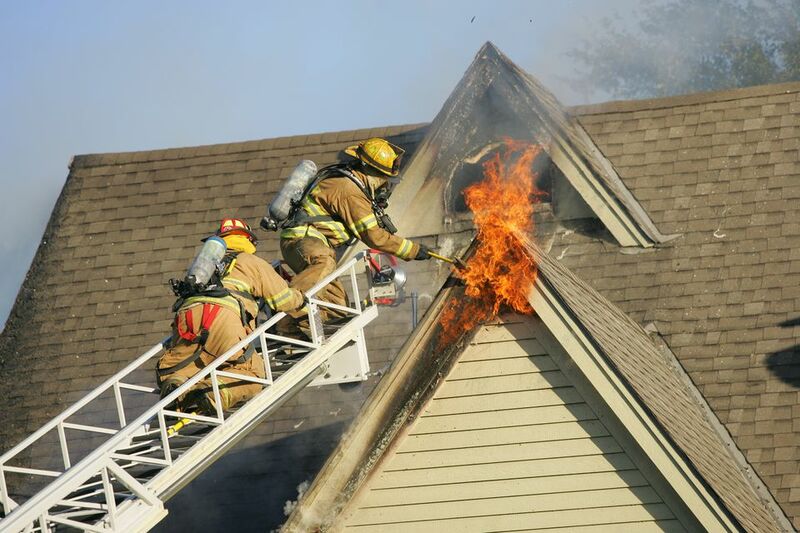 Smoke odors can linger for months and may have been trapped in the attic and wall insulation. Once the clean-up and renovation are complete, if you can still catch a smoky odor, consider a cleaning procedure called thermal fogging. A professional restorer will use a chemical fog to penetrate walls and insulation to neutralize the smoke odor. A thorough cleaning of the HVAC ductwork will also help reduce recurring odors. Some wet drapes and furniture may be able to be salvaged if the damage is slight. If the upholstered furniture is saturated with water and you want to save the wooden frame, the fabric and padding should be stripped immediately to prevent the growth of mold and mildew. When it comes to furniture and other items unable to be thrown in the washer, a professional cleaner should be used to tackle stains and smoke odors. Take clothes that are labeled as dry clean only to a dry cleaner and ask that in addition to cleaning, that they are treated to remove the smoke odors. For washable fabrics with soot stains, wash as recommended on the care label with a heavy-duty detergent and an oxygen-based bleach. If stains remain, mix a new solution of oxygen bleach and warm water and allow the stained items to soak at least four hours or overnight and rewash. For washable fabrics that are not stained but smell smoky, wash as usual but add one cup of baking soda to the final rinse cycle. If the clothing still smells smoky, fill the washer with water and two cups of baking soda and allow the clothing to soak overnight, then wash again as usual. Leather clothes, shoes, and accessories should be wiped down with a cloth dampened with plain water and then blotted dry. Allow all leather items to dry away from direct sun and heat sources to prevent mildew. Once the leather is dry, clean with a saddle soap and then use a leather conditioner to restore the supple finish. Leather and suede coats should be taken to a professional cleaner. Place books and papers that smell smoky in a large, sealable plastic container and add a powdered odor eliminator (Gonzo Odor Eliminator is a brand name). Seal the container for at least 48 hours. Remove the books and give them a sniff. If odor remains, reseal for a few more days. There are some items that should always be tossed after a fire. If the electricity has been off for more than four hours, even after a small fire, most refrigerated and frozen food should be tossed. If a freezer is full and undamaged, check for ice crystals and you may be able to salvage the food for up to eight hours. Any foods, even canned goods, that have been exposed to heat and firefighting chemicals should be tossed. The excessive heat can cause food to spoil even if the cans are not burned. Water, smoke, firefighting chemicals, and excessively high temperatures can ruin cosmetics and medicines. It is not worth risking your health to salvage these items. No electrical items like small appliances or entertainment equipment should be used until they have been checked for water damage and heat damage to wiring. Toss any questionable items to avoid the possibility of another fire.